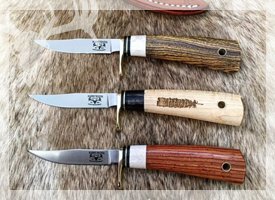 Fin & Feather - Choose from a Variety of Handle Materials; From the snow covered fields of corn stubble in Missouri to the winding trout streams in Michigan's Upper Peninsula, The Fin & Feather has become the knife of choice for sportsmen nation wide. The 3" blade is very manageable when cleaning waterfowl, upland game, wild turkey, and trout. Each blade is hand ground from 154CM and heat treated to 59-61 RC, giving it some flexibility and tremendous edge retention. Comes with a high quality leather sheath and a collectors box!! *NOTE: Do to Natural Materials, handles may vary in color and wood grain.